If you value low-maintenance gardening then the lilac bush (Syringa vulgaris) is the perfect plant for you. Lilacs provide the garden a light, sweet fragrance in the spring and the fragrance can be brought indoors with cut flowers. A deciduous shrub, the lilac thrives in almost any type of soil, it isn't bothered by insects and doesn't require a lot of fertilizer. 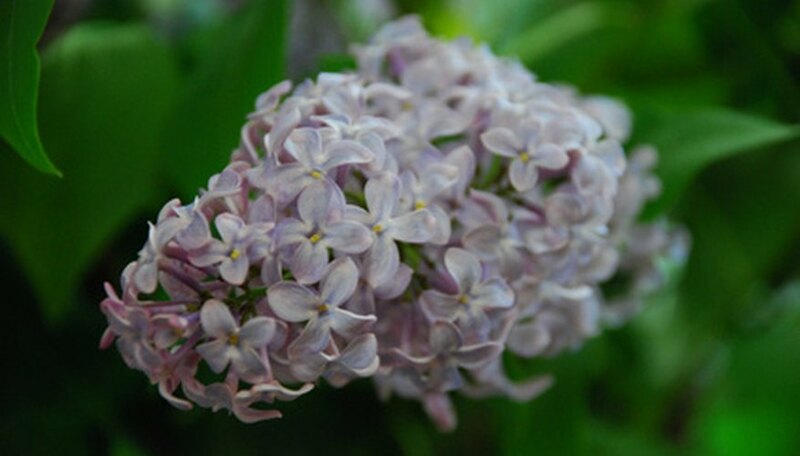 If your lilac bush is growing in or near the lawn, keep lawn fertilizers away from the lilac's root zone as excess nitrogen will cause the plant to produce more foliage and fewer flowers. Fertilize the lilac bush in early spring with a high-phosphorous fertilizer or bone meal, according to the rate suggested on the package. Rake up old mulch and any garden debris. Spread the fertilizer on the soil around the lilac; rake it in to the top 1/2 inch of soil and water. Apply a fresh layer of mulch around the lilac bush. Pour 3 inches of mulch onto the soil, 2 inches away from the bark, and spread it out to the widest part of the bush. Apply lime to the soil in the fall, if you live in a region with acidic soil. Apply the lime at the rate listed, and according to the directions on the package. Do not apply lime at the same time that you apply fertilizer.